Firebrand launched – so what? 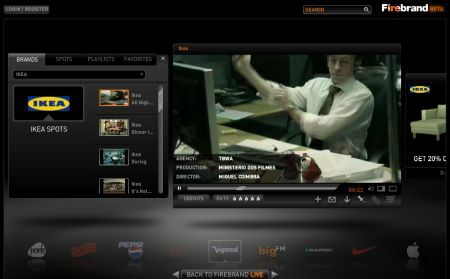 Firebrand now launched, and it has a wide selection of TV commercials online to watch. You can filter them by brand, animation, celebrity, etc. I particularly like the filter-selection „banned“, which could be quite promising in the future. What I miss: you can’t comment on the ads. You can rate them, but not comment on them. Might be due to lack of editorial staff, and I hope that is the only reason. Because some say, it might be, because advertisers have expressed concerns about people commenting on ads. One intelligent feature: as you can see on the screenshot above: offers of the advertisers can be integrated as clickable banners. Not sure if that always corresponds to what has been shown in the ad, but it would make sense. So who will actually use this? Some people who seek entertainment? They would go to YouTube, wouldn’t they? And the ad folks? Only if this becomes more complete than other ad databases (including YouTube). And what about including good print advertising? 4 myths of viral marketing: it is a replacement for television (most videos won’t get millions of viewers), a viral video is a digital strategy (what happens after the video has been watched? ), putting a video on YouTube is a digital strategy (most videos don’t really go viral without some help or trigger), bloggers are just waiting for videos they can write about (because there is so little other information around in this world). 7 deadly sins of advertising via viral video: Make a white and brown cow (instead of a purple, remarkable cow), pretend you’re not advertising (hoping it doesn’t backfire or gets ignored), spend a fortune on production (instead of a good idea), tell consumer instead of engage them (it’s not an adaptation of a 30 sec. spot), do a video contest because everyone else does (soon enough, it will get ever more difficult to activate consumers to the umpteenth contest), set unrealistic conversion measures (it’s not about conversion anyway, in most cases), throw in the towel and decide to just advertise around viral videos (at least to both in partnership). Is mass marketing important for viral success: Duncan Watts has modeled the viral phenomenon stating that it is not as contagious as we would like it to be. The circle of influence of superspreaders is far smaller than we thought, which this paper is about, and campaigns are subject to complete randomness, which makes this a channel in need of support of planned (i.e. media supported) advertising. Not true writes Nigel Hollis, saying that the stickiniess factor of the creative is not subject to randomness, as it can be pre-tested in focus groups. Is word of mouth a discipline or a channel: Discipline: Word of mouth marketing takes belief (based on understanding and knowledge) and discipline. Channel: The media buying companies and some advertising agencies want to see WOM as a channel. Discipline: To deliver on the promise of social media, word of mouth marketing, influencer marketing, conversation marketing – whatever part of WOM you want to emphasize – we need a simple, shared approach to measurement that compares well to what brand managers are used to. Channel: Many ad-based marketers see viral video as the answer to their WOM aspirations. And the conclusion: Word of mouth is a broad discipline like advertising or public relations. It requires technique and methodologies that are particularly relevant to do it well. It is possible to treat it like a channel by tacking on some WOM tactic to a larger advertising program, but it may not pay off in comparison to those more traditional marketing tactics. The Net’s most adored lawyer brings together John Philip Sousa, celestial copyrights, and the „ASCAP cartel“ to build a case for creative freedom. He pins down the key shortcomings of our dusty, pre-digital intellectual property laws, and reveals how bad laws beget bad code. Then, in an homage to cutting-edge artistry, he throws in some of the most hilarious remixes you’ve ever seen. Sofar, advertising on joost has only been in the form of short ads at the beginning or end of clips. Sort of like the traditional ad model. You can download it at „Coke Bubbles„. While I am unsure about whether this is a really clever idea, I do support the fact that Coke does not just run ads in the clips, but does try to provide added value. It’s a first step in the right direction. A lot of marketing efforts will have to provide a clear added value in the future. Either through real product information at the points where consumers are seeking information. Or, alternatively, if consumers are not seeking product information, brands can help to provide plattforms, contents or tools for entertainment or networking – two of the other main things people seek out in digital media these days. Karsten Wenzlaff about Facebooks advertising models, and beacon / data privacy in particular.